If you’re running an online business, search rankings are super important. The more people that see your site, the better. High rankings can mean more customers and more sales. If you’re taking a dip in search rankings, it can be super frustrating, but have no fear! 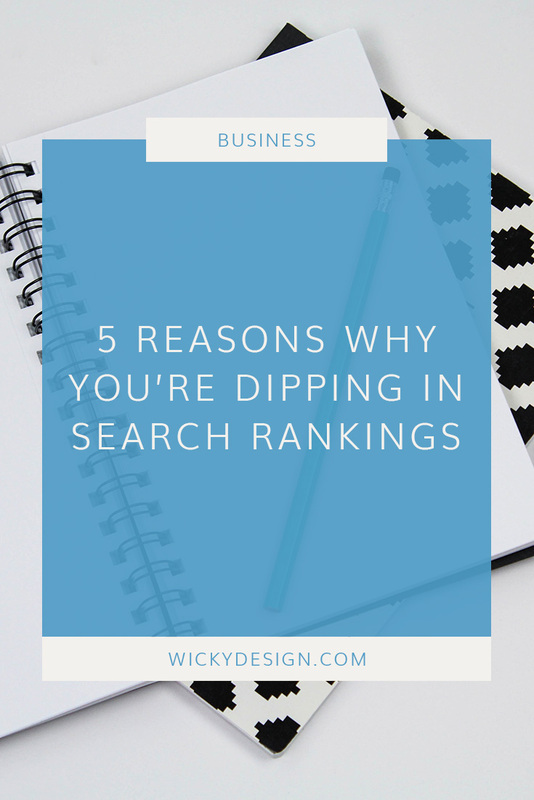 Today, we’ll go over 5 things that might be causing your website to dip in search rankings and what you can do to fix them. If your pages are cluttered, your navigation is confusing and it’s hard to find things on your site, people are simply going to give up and go somewhere else. If Google sees that a visitor goes to your site, then quickly goes away, that’s considered a bounce. Sites with high bounce rates have weaker search position because Google thinks that the user wasn’t able to find what he/she was looking for. Clean up your website! Make things a lot easier to find, have clear navigation and don’t have things all over the place. Keep things simple. Google’s main objective is to provide quality results, so the easier you make it for people to find things, the better! Learn more about how we can help with your website design. Content is super important for branding, but also for SEO! Google likes pages that are longer and more informative because it gets people to stay on your site longer. The amount of time someone stays on your site has an impact on your search position. The more informative a page is, the better it will do in Google. How can you get people to stay on your site longer? If there are certain pages on your website where you can add content or change things around, definitely consider updating them. For example, if your about page just has a photo of you and a few paragraphs of text, you might want to consider adding some additional images and laying out the content differently so it encourages people to scroll down the page. If you have a blog, consider writing longer, more informative articles rather than shorter ones. In the past, 300- 350 words was good for a blog post, but now Google prefers articles with more meat. Instead of writing short articles a few times a week, consider writing a longer, more informative article once a week. If you haven’t updated your site in a while, you could be taking a hit in rankings. Google likes sites with fresh content. If you launched your website a year ago and haven’t touched it since it might be time to go in and make some updates. Have you added new employees? Google has an awesome tool called PageSpeed Insights that will give you recommendations on how to make your site faster. We wrote a detailed post about it here! Be sure to optimize all of your images. There is never a reason to upload a 3,000px wide image to a space that is only 300px. Make sure you’re uploading appropriately sized images, otherwise your site will load slowly. Clean up any plugins. If you aren’t using a plugin, get rid of it! Plugins can weigh down a website, so only use them if you absolutely need to. It’s 2019. You have to have a mobile friendly website! It’s not an option anymore and has been this way for a long time. Google penalizes you if your website is not mobile friendly. This, along with speed, are the two biggest problems we see on websites that aren’t doing well in search rankings. It’s time to get your website up to date. If you want to start doing well in Google again, you need to redesign your site so it looks just as good on a phone as it does on a computer. Statistics show that more people are looking at your website on their phones now, so you have to make it easy for them to use. If you have noticed a dip on your search rankings, these 5 things could be part of the problem. Need to spruce up your site? We’d love to help. Contact us today to learn more about our web design services.